Not to be outdone, supporters of Andrew Jackson in 1835 sent him a 1,400 pound block of cheddar that was left over from a fair in Oswego, New York. By 1837, as Jackson prepared to leave office, a considerable amount of the cheese still remained, and Jackson did not wish to arrange for its transport to the Hermitage in Nashville, where he would be retiring. So, he arranged for the White House to be opened to the public. Within two hours, over 10,000 visitors had devoured the entire block. So why are blocks of cheese, 19th century presidents, and old television dramas relevant to today? Well, the motive for the original cheese being sent to Jefferson had little to do with showing off the dairy products of the Bay State. Reverend Leland had supported Jefferson in the election of 1800 in the face of fears from his congregation that Jefferson would curb the religious freedoms that had allowed the Calvinists to find safe haven in the U.S. The present was meant to thank Jefferson and secure the relationship between the president and the various American Protestant streams. In Jackson’s time, the cheese shifted from being a symbol of religious freedom to a symbol of the people having open access to their elected officials. Though Sorkin took some liberties in explaining Jackson’s actions and motives, his re-imagining of the event is consistent with Jackson’s efforts to cast himself as a populist president. Just about the only resident of Washington, D.C. who was not enamored of that big block of cheese was Jackson’s Vice President and successor, Martin Van Buren, who had to rid the White House of the stench of a huge, two-year-old block of cheddar! The issue of religious freedom and how our government responds to the rights and concerns of individuals has garnered significant attention lately, thanks to some decisions by the U.S. Supreme Court and events unfolding on the national stage. We won’t attempt to resolve things over a two-ton block of cheddar (though it might make for an interesting oneg), but it is worthy of consideration in light of its meaning and implication for American Jews. On June 30, the court announced its decision in Burwell v. Hobby Lobby, a case that was closely watched by many all across the religious spectrum. The Burwell in this case was Sylvia Burwell, Secretary of Health and Human Services, who argued that the provisions of the Affordable Care Act- colloquially known as “Obamacare”- required Hobby Lobby (and their co-plaintiffs, Conestoga Wood Products) to provide contraceptives to their employees. The Green family, an evangelical Christian family that owns Hobby Lobby, and the Hahn family, the Mennonite family that owns Conestoga, claimed that such a requirement violated their religious beliefs and was therefore illegal under both the Religious Freedom Restoration Act of 1993 and the first amendment protections of religious freedom afforded by the U.S. constitution. I’m not a constitutional scholar by any stretch of the imagination. But over the years, I’ve followed enough court decisions to know that oftentimes the debate amongst the justices comes down to how one reads the constitution. The nine men and women of the nation’s highest court have been tasked with deciding how each case before them relates to the original intent of the framers of our nation’s foundational document. For Jews, our foundational document is not a constitution, but rather a Torah. And for progressive Jews who seek to marry tradition with modernity, we vary in the degree of authority that we allow Torah to exert in legislating our behavior. 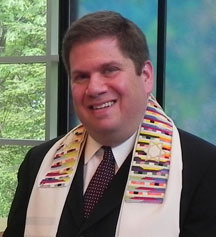 But that very interpretation, what more than one modern theologian has called “informed choice” – whereby we explore the full compliment of laws and precepts in the Torah and adopt into our lives those which best bring us meaning and elevate our personal spirituality—that interpretation is based on the principle of trying to figure out the original intent of the framer (or framers) of the Torah. This is a process that has been going on throughout Jewish history, beginning with the work of our prophets and continuing through the Talmudic period right up to today. To cast Rabbi Grater’s assertion in a slightly different light, consider the Torah selection that we will read on Yom Kippur morning. This passage, which was read just last week as part of Parashat Nitzavim, speaks of Torah’s accessibility to all who would seek to understand its messages. “Lo bashamayim hi,” Moses proclaims. Torah is not in the heavens, that we must send someone skyward to retrieve it for us. Indeed, lo bashamayim hi became a mantra of sorts for later generations of rabbis, who used this phrase to argue that we were subject to the spirit of its laws, but not always to the letter of them. God had shaped the framework of the Torah to provide us moral and ritual guidelines for our lives, they posited, but then had left it in the hands of humanity to apply its precepts to everyday living. The way I choose to apply said principles to my life decisions most likely will differ in at least some manner from the way you apply them to your life. While that’s fine in the arena of religious practice, it becomes incredibly problematic when we are talking about a legal system. In order to maintain a just and democratic society, the laws and precepts of the constitution, and the subsequent layers of interpretation, must have equal applicability to all Americans. Since these two approaches- the guidance of Torah (or other sacred texts) and the guidance of the constitution (and other legal documents of this country)- are often at odds with one another, ultimately someone must determine where the public sphere ends and the private sphere begins. This, to me, is what makes the Hobby Lobby case, Citizens United, and so many other recent decisions by the Roberts court so troubling: that line between public and private sensibilities has become ever murkier. Love it or hate it, the Affordable Care Act is the law of the land. If the law conflicts with your private faith, then perhaps there are workarounds that will protect your right to free exercise of your religion—indeed, Health and Human Services suggested possible adjustments to the contraception provision that troubled the Green family. Your faith does not make you a protected class that can tread upon the rights and opportunities of others. If an employee requires kosher or halal food, or permission to wear a headcovering in the workplace, or the opportunity to take a break from the workday to engage in prayer, the employer can and should make reasonable accommodations to allow for such practices. And the employee has legal recourse if such arrangements are not made. But the law does not (and should not) mandate that all food must be kosher, that all workers must wear kippot or turbans or hijabs, or that everyone must engage in prayer. My expression of my faith may bridge from the private sphere into the public sphere so long as I do not inhibit another person’s free exercise of faith, or his or her right to abstain from any religious affiliation at all. To me, being religiously free does not mean that one gets to discriminate against those who believe or behave differently. It does not mean that your reading of your sacred text is allowed to trump the law of the land. Virtually every religious tradition or secular code of morality contains some variation on the so-called “Golden Rule”: that we should treat others the way that we, ourselves, would wish to be treated. All of us would do well to heed this teaching, to spend less time worrying about our differences and fearing or condemning the “otherness” of our neighbors. If each religious group battling for primacy in the public sphere would focus their religious fervor on making this world a better place, think of the great things that could be accomplished. Hayom Harat Olam, this is the day of the world’s creation. When, in that first burst of creative energy, God decided to create humankind, only one creature was fashioned. This was part of a purposeful design, the rabbis teach, so that no future person could say, “My ancestor was greater than yours.” May all come to embrace this approach to religious freedom, recognizing that though we may have sought different paths to Truth, we share a common brotherhood and sisterhood. May we all come to sit under our vine and fig trees, unafraid– and perhaps share some conversation over a nice piece of cheese. “The Crackpots and These Women,” West Wing episode first aired October 20, 1999. Written by Aaron Sorkin.